Thanks from me too. MDWS profile duly amended! Mine still up using DSLStats was thinking power cut at Tony's but cant be. You've possibly got a hung instance of hg612 stats, check the time the last stats where read in the GUI. If it's not current restart the PC. Thanks for the note, Tony. I've been out today, and initially thought something was wrong my end when I noticed the gap in the MDWS trace! I really appreciate the time and effort you put in to maintaining the site. It's a great tool to be able to compare one's own figures with others. Or is it automatic, & I just need to exercise a little patience? See http://forum.kitz.co.uk/index.php/topic,14361.msg360386.html#msg360386 in this topic. Reckon you need to wait for Tony to come along. There is no reverse DNS published for your current IP Block so trying to look up the ISP automatically (using a provided function) fails and just returns the IP address. The IP change itself was detected by MDWS within a couple of minutes of the change but it leaves the ISP as it was under those circumstances which are fairly rare. A manual WHOIS will get it though. I've changed it. There definitely seems to be something 'odd' about Vodafone. Unless I manually set the DNS servers, my own router declares "DNS fail" or something similar, and I get no internet access even though I have sync on the broadband. 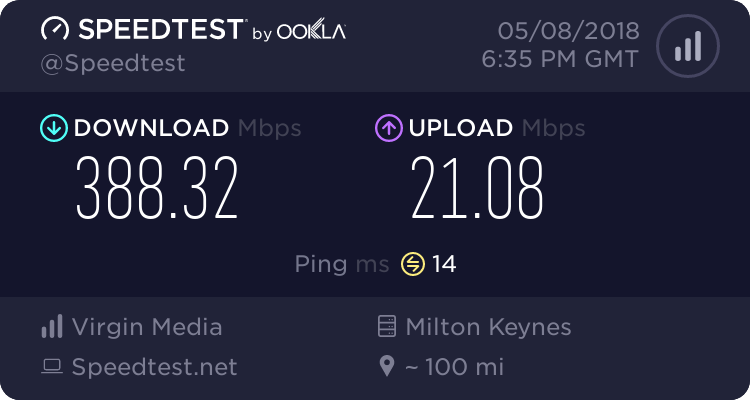 Using the Vodafone supplied router, I have no such trouble most of the time...although that did lose the internet for 10 minutes the other night without losing sync. However, the VF router doesn't give line stats, so combined with its unreliability it's a no-go for me. I am unable to access the MyDSLWebStats site from my home IP (202.67.x.x) but works fine from my work address (posting from there now), both IP's are in Australia one on Exetel (works) the other on Dodo (blocked?). What, if anything can be done to fix it? Send Tony (tbailey2) a PM with your home IP. It's primarily a UK service and I'm pretty sure Tony blocks entire IP ranges for security reasons.